The yield curve inverted and that led to a scramble among analysts to forecast the implications. The most obvious implication is that the yield curve typically inverts prior to a recession. That seems to be well known and is now widely covered in the financial media. The relationship between an inverted yield curve and recessions can be seen in the chart below. The chart shows the difference in interest rates between the 10 year Treasury note and the 3 month Treasury bill. This is one way of looking at the yield curve which measures the differences between interest rates of varying lengths. When the yield curve is normal, the value of this interest rate spread is above zero which indicates that the rate on ten year Treasuries exceeds the rate on three month Treasuries. This is what we’d expect since longer term loans generally carry higher interest rates. The dark horizontal line in the chart above marks zero. Moves below zero have been followed by recessions which are shown as the vertical grey bars on the chart. 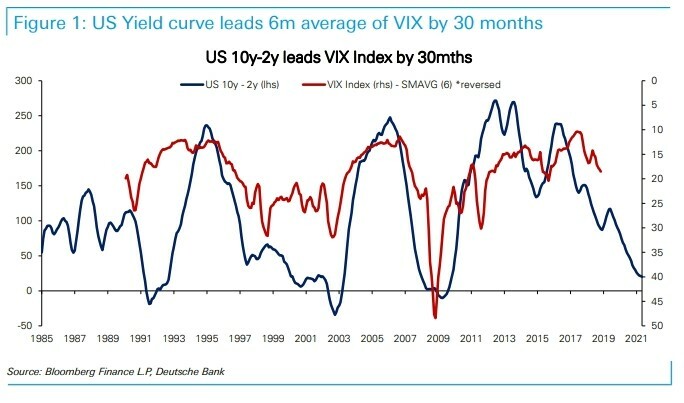 A research note from Alan Ruskin, global macro strategist at Deutsche Bank, according to MarketWatch.com notes the relationship between the yield curve and the volatility of the stock market. “Fear not, ‘the vol cavalry’ are finally coming. Who says so? The yield curve,” he said, in a [recent] note. It ends up that the yield curve is very strongly correlated with all the usual measures of stress, including the VIX, the Cboe Volatility Index, an options-based measure that illustrates expected S&P 500 volatility over the coming 30-day period (see chart below). “In all cases, the message is fairly simple — the ‘vol cavalry’ are indeed coming, but they have had a long ride in, for the yield curve typically leads the…vol measures by close to three years,” he said. Indeed, the typical lag between the 10-year/2-year yield curve and the VIX is 33 months, while bond and currency volatility lag by 36 and 40 months, respectively. For those that view volatility as synonymous with trading opportunities, those long lags aren’t as worrisome as they may sound, Ruskin said. He noted that the curve has been trending flatter since 2014. The VIX has been near a level of 15 recently, less than half the level reached in late December when the VIX closed as high as 36.07. The current readings are below the VIX’s long term average which is over 19. MarketWatch asked, “So why does a flatter curve portend volatility? It’s because flattening tends to lead growth slowdowns, which are themselves associated with an increase in volatility. “In this way, rather than attributing direct causation, it could be that the yield curve is a good leading indicator of the growth cycle, and it is growth that may be more directly causing/influencing volatility,” Ruskin said. Of course, it’s possible that the currency cycle is different. Interest rates across major economies remain extremely low, which means that adjustments in policy rates will be modest, limiting the potential for big moves in rate spreads, which are the “bread and butter” of currency volatility. Other policy measures, including the Bank of Japan’s yield-curve control program are a “direct attack” on bond volatility, he said. While VIX itself is not directly tradable, iPath S&P 500 VIX Short-Term Futures ETN (NYSE: VXX) does show a high correlation to the index and could be used to trade this idea. VXX is an Exchange Traded Note (ETN). An ETN is similar to an ETF. It can be bought and sold just like a stock and has low trading costs. The difference between the two is that an ETF owns stocks while an ETN owns derivatives, adding another level of risk to the investment. Underlying holdings consist of futures contracts on the VIX. These are exchange trade futures and are therefore as free from default risk as possible for a derivative. That makes VXX an ideal choice for conservative investors seeking a volatility trade. If there is an increase in volatility the ETN should be expected to move higher. That could deliver gains to investors. Because of the risk, investors might want to consider using options on VXX. A call option on VXX could move higher if the price of the ETN rallies. However, the risk is limited to whatever the investor pays to open the trade. Call options are generally available for less than 10% of the price of the underlying security and will lead to risks of just a few hundred dollars, or less, to potentially benefit from the price move of 100 shares. While calls might not be right for all investors, they could be the most risk averse trade for investors seeking to gain exposure to volatility as an asset.